We may earn money or products from the companies mentioned in this post. This will be at no extra cost to you. Your help is very much appreciated. SPECIAL STITCHES: Treble = Wrap the yarn around the hook twice, insert the hook into the chain or stitch of work you are working on. Draw up a loop on the hook and bring back through the chain or stitch. You will have 4 loops on hook. Yarn over and bring yarn through 2 loops. You will now have 3 loops on hook. Yarn over and bring through 2 loops. Yarn over again and bring through remaining 2 loops. Treble made. Double Treble = Wrap the yarn around the hook 3 times, insert the hook into the chain or stitch of work you are working on. Draw up a loop on the hook and bring back through the chain or stitch. You will have 5 loops on hook. Yarn over and bring yarn through 2 loops. You will now have 4 loops on hook. Yarn over and bring through 2 loops. You will now have 3 loops on hook. Yarn over and bring through 2 loops again. Yarn over and bring through the remaining 2 loops. Double Treble made. NOTE: I did not join my rounds. I used a stich marker, ( in my case, just a piece of contrasting yarn ) and just went on into next round. With CHERRY RED yarn, make a magic circle. RND 1: With CHERRY RED yarn, make magic cirle. Ch 1, hdc 12 times. (12 sts) Use a stitch marker from this point throughout rest of body. RND 11: Hdc in each stitch around. When you come to marker, sc in next st, sl st in the next. Do not fasten off. ROW 1: Still using Cherry Red yarn, ch 1, sc in same stitch. Sc in next 23 stitches across. (24 sts) Ch 1, turn. ROW 2: Sc in first stitch and in each stitch across. (24 sts). Ch 1, turn. ROW 3: Sc dec in first 2 stitches ( sc together). Sc in next 20 stitches, Sc dec in last 2 stitches. (22 sts) Ch 1, turn. ROW 4: Sc in first stitch and in each stitch across. (22 sts) Ch 1, turn. ROW 5: Sc dec in first 2 sts, sc in next 18 sts, sc dec in last 2 sts. (20 sts) Ch 1, turn. ROW 6: Sc in first st and in each st across. (20 sts) Ch 1, turn. ROW 7: Sc dec in first 2 sts, sc in next 16 sts, sc dec in last 2 sts. ( 18 sts) Ch 1, turn. ROW 8: Sc in first st and in each st across. (18 sts) Ch 1, turn. Row 9: Sc dec in first 2 sts, sc in next 14 sts, sc dec in last 2 sts. (16 sts) Ch 1, turn. ROW 10: Sc in first st and in each st across. (16 sts) Ch 1, turn. ROW 11: Sc dec in first 2 sts, sc in next 12 sts, sc dec in last 2 sts. (14 sts) Ch 1, turn. ROW 12: Sc in first st and in each st across. (14 sts) Ch 1, turn. ROW 13: Sc dec in first 2 sts, sc in next 10 sts, sc dec in last 2 sts. (12 sts) Ch 1, turn. ROW 14: Sc in first st and in each st across. (12 sts) Ch 1, turn. ROW 15: Sc dec in first 2 sts, sc in next 8 sts, sc dec in last 2 sts. (10 sts) Ch 1, turn. ROW 16: Sc in first st and in each st across. ( 10 sts) Changing to WHITE yarn, ch 1, turn. ROW 17: Using WHITE yarn, sc dec in first 2 sts, sc in next 6 sts, sc dec in last 2 sts. (8 sts) Ch 1, turn. ROW 18: Sc in first st and in each st across. (8 sts) Changing to BLACK yarn, Ch 1, turn. ROW 19: Using BLACK yarn, sc dec in first 2 sts, sc in next 4 sts, sc dec in last 2 sts. (6 sts) Ch1, turn. ROW 20: Sc in first st and in 5 remaining sts. (6 sts) Ch 1, turn. ROW 21: Sc dec in first 2 st, sc in next 2 sts, sc dec in last 2 sts. (4 sts) Ch 1, turn. ROW 22: Sc in first st and in remaining 3 sts. (4 sts). Ch 1, turn. ROW 24: Dec the last 2 st together and end off. Weave in ends. With right side of work facing you and using CHERRY RED yarn – join with sl st in the next stitch to the left of first leg. ROW 1: Ch 1, sc in same stitch. Sc in next 23 sts. (24 sts) Ch 1, turn. ROWS 2 – 24: Repeat as for Rows 2 – 24 worked on first leg. With right side of work facing you and using CHERRY RED yarn – join with sl st in the next stitch to the left of second leg. ROWS 2 – 18: Repeat as for Rows 2 – 18 worked on first leg. Changing to WHITE yarn – Ch 1, turn. ROWS 19 – 24: Using WHITE yarn, repeat as for Rows 19 – 24 worked on first leg. With right side of work facing you and using CHERRY RED yarn – Count 24 stitches from the left side of the first arm just worked. SKIP those stitches. Insert hook and join yarn with sl st in next st. ROWS 1 – 18: Repeat as for Rows 1 – 18 worked on first leg. Changing to WHITE yarn – Ch 1, turn. With right side of work facing you and using CHERRY RED yarn – Join yarn in first stitch to the left of the second arm. You will work back across the last remaining 24 stitches of the Body round. ROW 1: Ch 1, sc in same st and in next 23 sts. (24 sts) Ch 1, turn. ROW 2: Sc in first st and in each st across. (24 sts) Changing to WHITE yarn – Ch 1, turn. ROWS 3 – 18: Using WHITE yarn – Repeat as for Rows 3 – 18 worked on first leg. ( Should have 8 sts at end of row 18) Changing to CHERRY RED yarn – Ch 1, turn. ROWS 19 – 24: Using CHERRY RED yarn – Repeat as for Rows 19 – 24 worked on first leg. Fasten off. Using CHERRY RED yarn – Work same as for BODY on SANTA BACK. Work same as for FIRST LEG on SANTA BACK. Work same as for SECOND LEG on SANTA BACK. With right side of work facing you, and using CHERRY RED yarn – join red in the first st to the left of the second arm. You will work back across the last remaining 24 sts of the Body round. ROWS 1 – 2: Using CHERRY RED yarn – Repeat as for ROWS 1 – 2 of SANTA HEAD (BACK). Changing to WHITE yarn – Ch 1, turn. ROW 3: Working in FRONT LOOPS ONLY, and using WHITE yarn – Sc dec the first 2 sts together. *sc, hdc in next st. Dc, dtr in next st. Trtr twice in next st. Dtr, dc in next st. Hdc, sc in next st*. Repeat * to * 3 times. Sc dec in the last 2 sts. Second half of Row 3: Turn work, working in unworked back loops of previous row – sc dec first 2 sts. Sc in next 20 sts (unworked back loops). Sc dec in last 2 sts. (22 sts across this second half or Row 3) Turn. ROW 4: Working in FRONT LOOPS ONLY – Ch 1, sc dec first 2 sts. *sc, hdc in next st. Dc, dtr in next st. Dtr, dc in next st. Hdc, sc in next st*. Repeat * to * 4 more times. Sc in last st. Second half of Row 4: Turn work, working in unworked back loops of previous row – sc in each unworked back loop across. (22 sc st across second half of Row 4) Turn. ROW 5: Working in FRONT LOOPS ONLY – Ch 1, sc dec first 2 sts. *Sc, hdc in next st. Dc, dtr in next st. Dtr, dc in next st. Hdc, sc in next st*. Repeat * to * 4 more times. (You will end up with hdc, sc in the last st) Second half of Row 5: Turn work, sc dec first 2 sts, sc in next 18 sts (unworked back loops). Sc dec last 2 sts. (20 sc sts worked across second half of Row 5) Turn. ROW 6: Working in FRONT LOOPS ONLY – Ch 1, Sc in first st. *Sc, hdc in next st. Dc, dtr in next st. Dtr, dc in next st. Hdc, sc in next st*. Repeat * to * 3 more times. (You will have 3 front loops left to work) Sc, hdc in next st, 2 dc in next st. Hdc, sc in last st. Second half of Row 6: Turn work, sc in first st, and in each st across (unworked back loops). (20 sc sts across second half of Row 6) Turn. ROW 7: Working in FRONT LOOPS ONLY – Ch 1, Sc dec the first 2 sts. * Sc,hdc in next st. Dc, dtr in next st. Dtr, dc in next st. Hdc, sc in next st*. Repeat from * to * 3 more times. Sc dec the last 2 sts. Second half of Row 7: Turn work (working in unworked back loops), sc dec first 2 sts, sc in next 16 sts, sc dec the last 2 sts. (18 sc sts across second half of Row 7) Turn. ROW 8: Working in FRONT LOOPS ONLY – Ch 1, Sc in first st. * Sc, hdc in next st. Dc, dtr in next st. Dtr, dc in next st. Hdc, sc in next st*. Repeat * to * 3 more times. Sc in last st. Second half of Row 8: Turn work (working in unworked back loops), Sc in first st and in each st across. (18 sc sts across second half of Row 8) Changing to BABY PINK yarn, turn. ROW 9: Using BABY PINK yarn and crocheting through BOTH LOOPS again, ch 1. Sc dec the first 2 sts, sc in next 14 sts, sc dec the last 2 sts. (16 sts) Turn. ROW 10: Ch 1, sc in first st and in each st across. (16 sts) Turn. ROW 11: Ch 1, sc dec the first 2 sts, sc in next 12 sts, sc dec the last 2 sts. (14 sts) Turn. ROW 12: Ch 1, sc in first st and in each st across. ( 14 sts) Turn. ROW 13: Ch 1, sc dec the first 2 sts, sc in next 10 sts, sc dec the last 2 sts. (12 sts) Turn. ROW 14: Ch 1, sc in first st and in each st across. (12 sts) Turn. ROW 15: Ch 1, sc dec the first 2 sts, sc in next 8 sts, sc dec the last 2 sts. (10 sts) Turn. ROW 16: Ch 1, sc in first st and in each st across. (10 sts) Changing to WHITE yarn, turn. ROW 17: Using WHITE yarn, Ch 1, sc dec the first 2 sts, sc in next 6 sts, sc dec the last 2 sts. (8 sts) Turn. ROW 18: Ch 1, sc in first st and in each st across. (8 sts) Changing to CHERRY RED yarn, turn. ROW 19: Using CHERRY RED yarn, ch 1, sc dec the first 2 sts, sc in next 4 sts, sc dec the last 2 sts. (6 sts) Turn. ROW 20 – 24: Repeat as for Rows 20 – 24 worked on first leg. Fasten off. RND 3: Sc in each st around. (6 sts) Fasten off, leaving about 8” to sew on. Using photo for placement, sew onto face about 3 rows up from beard. Using CHERRY RED yarn, ch 6. Sc in second chain from hook and in the remaining 3 chains. (4 sc) Fasten off, leaving about 8” for sewing on. Sew on in a slight upward turn between nose and beard. Using WHITE yarn, make 2. Ch 9. Sc in second chain from hook. Hdc in next stitch. Dc in next 2 sts. Hdc in next 2 sts. Sc in next st. Sl st in last st, fasten off leaving about 8” for sewing on. Sew each half of moustache on towards bottom of nose and slightly overlapping mouth. Sew the button eyes on equally spaced on third and fourth rows from white part of hat. Sew decorative buttons down front. Single crochet the BACK and the FRONT piece together (or you could just whipstitch around if you like). I started between one leg and an arm point so that I could stuff closed from the bottom. Match up the head, arm and boot points, and sc together, single crocheting in the ends of the rows around and 3 sc in each corner point. Be sure to stuff Santa well and finish single crocheting to close. Also I matched my yarn accordingly as I worked. 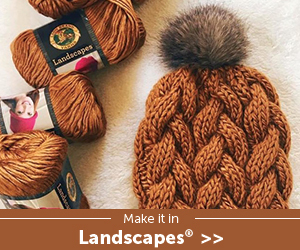 Sew a large WHITE pom-pom to top of hat. Sweaters Wonderful to Fall For!